1. Phillips M, Rosenberg A, Shopsin B, et al. Preventing surgical site infections: A randomized, open-label trial of nasal mupirocin ointment and nasal povidone-iodine solution. Infect Control Hosp Epidemiol. 2014; 35(7): 826-832. 2. Bebko SP, Green DM, Awad SS. Effect of a preoperative decontamination protocol on surgical site infections in patients undergoing elective orthopedic surgery with hardware implantation. JAMA Surg. Published online March 04, 2015. doi:10.1001/jamasurg.2014.3480. 3. Torres EG, Lindmair-Snell JM, Langan JW, Burnikel BG. Is preoperative nasal povidone-iodine as efficient and cost-effective as standard methicillin-resistant Staphylococcus aureus screening protocol in total joint arthroplasty? J Arthroplasty. 2016; 31: 215-218. 4. Rivera K, Smith R, Hardenstine H, Rose L, Snedeker L, Wolfgang J. Implementation of a total joint replacement pre-operative skin and nasal decolonization process for the reduction in Staphylococcus aureus (SA) and methicillin resistant Staphylococcus aureus (MRSA) infection. Presented at the APIC National Conference, Charlotte, NC, June 2016. 5. Rezapoor M, Nicholson T, Patel R, Mostafavi R, Chen AF, Parvizi J. Do iodine-based solutions differ in their effectiveness for decolonizing intranasal Staphylococcus aureus? Presented at the MSIS Annual Meeting, Cleveland, OH, August 2015. 6. Flynn NA, Carr M. Skin and Nasal Antiseptic use in the prevention of post-operative infections. Presented at the SHEA Conference, Orlando, FL, May 2015. 7. Brown L, Shelly M, Greene L, et al. The effect of universal intranasal povidone iodine antisepsis on total joint replacement surgical site infections. Presented at the APIC National Conference, Anaheim, CA, June 2014. 8. Waibel ML. Revisiting process improvement for total joint arthroplasty SSI. Presented at the APIC National Conference, Fort Lauderdale, FL, June 2013. 9. Hogenmiller JR, Hamilton J, Clayman T, et al. Preventing orthopedic total joint replacement SSIs through a comprehensive best practice bundle/checklist. 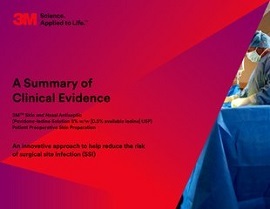 Presented at the APIC National Conference, Baltimore, MD, June 2011. 10. Osborn N, Reynolds L.Embedding an Infection Preventionist (IP) in the OR. Presented at the AORN Surgical Conference and Expo, Denver, CO, March 2015. *Nozin® Nasal Sanitizer® Mean S. aureus kill rate after 3 applications in healthcare workers. Steed LL, Costello J, Lohia S, Jones T, Spannhake EW, Nguyen S. Reduction of nasal Staphylococcus aureus carriage in healthcare professional by treatment with nonantibiotic, alcohol-based nasal antiseptic. Amer J Infect Control. 2014;42:841-6. ‡Reduces bacterial counts in the nares in 1 hour, including Staphylococcus aureus by 99.5%, and maintains this reduction for at least 12 hours. 3M Study-05-011100.